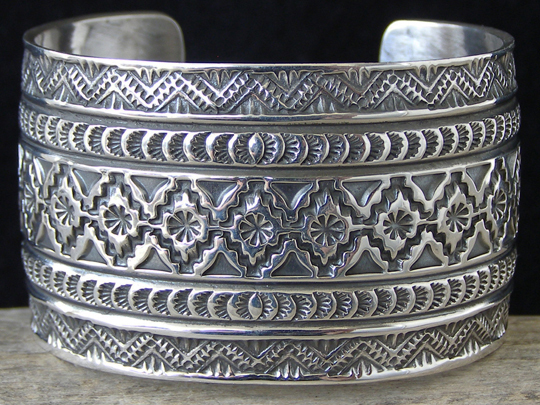 Sunshine Reeves Stamped Sterling Bracelet size 6 1/4"
This is the sort of signature work for which Sunshine is best known; deep stampwork of intricate patterns of banded stripes. This is stamped with Sunshine's handmade stamps which are unique to his work. We love turquoise, but the heart of a fine traditional piece is the stampwork and discerning collectors know this. Very few silversmiths can achieve such perfect symmetry over such an expanse of silver. Note on sizing: This could easily be adjusted to 1/8" larger or smaller. It's important, however, to respect a proportional opening of the bracelet's gap to assure proper fit. Hallmarked SUNSHINE REEVES and stamped Sterling inside. Uniform width of cuff: 1 3/8"